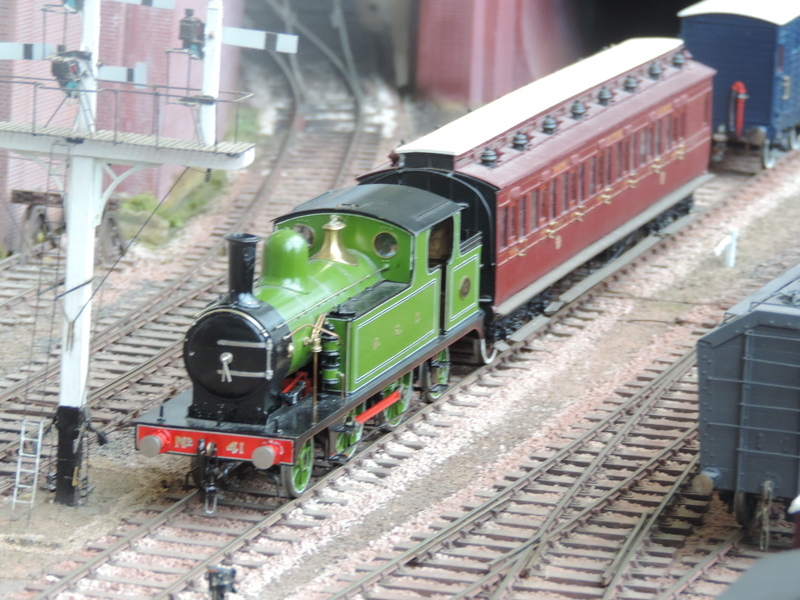 Today we are looking at some more of the great layouts that were on show at the Fareham MRC Railex show last weekend. 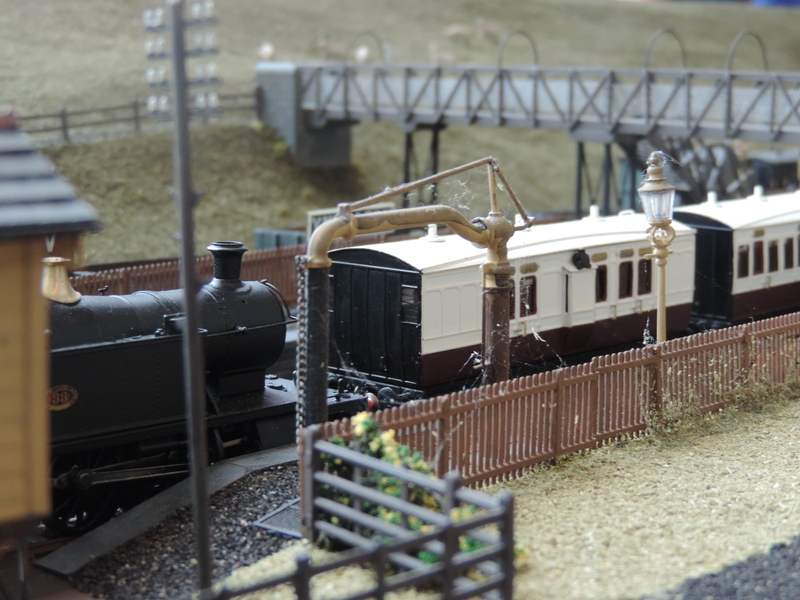 Up first we have Abbostone an O Gauge finescale layout built by the Winchester Railway Modellers. Abbotstone represents a Midland Railway through station on the route from the midlands to London. Today the line is blocked beyond the station and all trains are terminating with passengers being provided with alternative means of continuing their journeys. 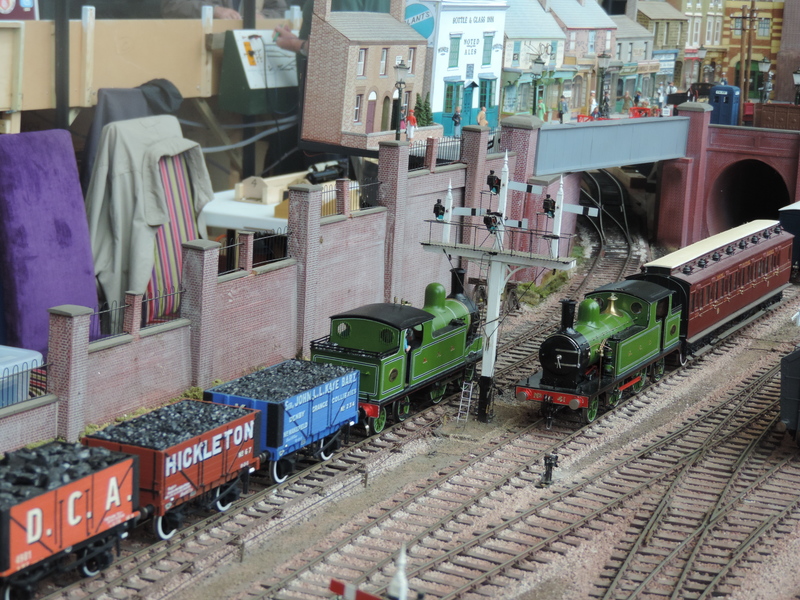 Being a ‘club layout’, stock today will not necessarily be representative of the Midland area. Abbotstone, in its exhibition mode, measures 10m by .75m (except for the MPD which is added at exhibitions). 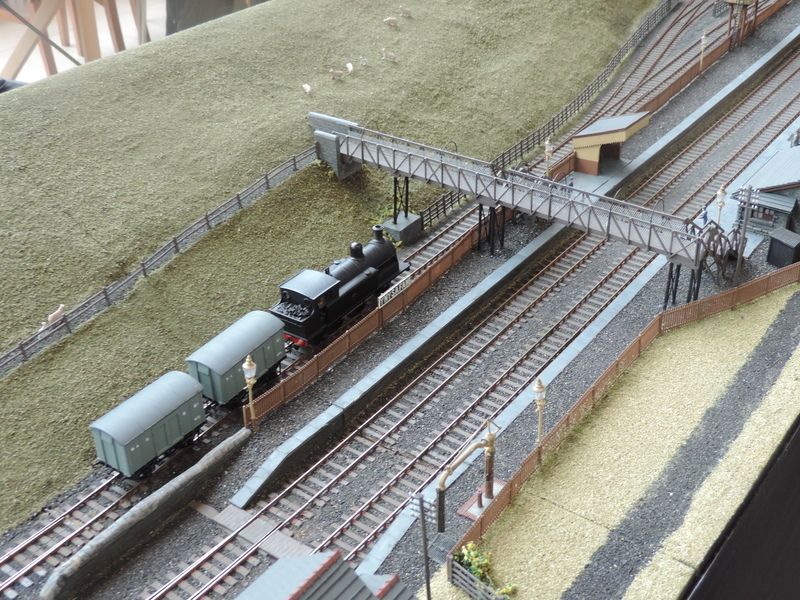 The layout is run in two separate halves, split between the main line and the branch line. From time to time, vehicles are exchanged between the two halves and this adds interest to the operation (and confusion to the operators!). The layout therefore requires two ‘signalmen’ and two drivers with two fiddle yard operators. Add to this the two yards that also have controllers, club running nights are busy affairs and keep many members employed during the session. The MPD is a recent addition and allows us to use tender engines on the main line trains if required. Light engine movements to and from the MPD are frequent where locomotives are turned and supplied as required. One team runs the main line and has 4 fiddle yard roads joined by points. A cassette at the end allows for locomotive turning when necessary. 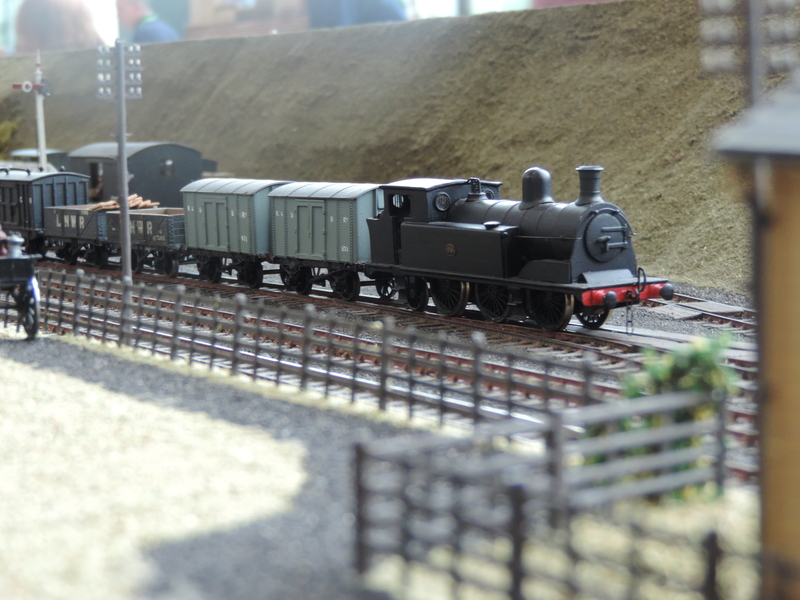 A fifth train is always on the layout to provide public interest. The other team operates the Branch and this has arrival and departure roads in the fiddle yard with 3 other roads fed by a traverser. There is no need to turn stock on the branch as only tank engines are used. The branch has a ‘private siding’ that serves a “coffin makers business”. This means regular exchange of wagons within the sequence to provide timber in open wagons and take away the finished coffins in vans. I got to admit I loved watching the little tank engines go past on this layout, with the size of the locos they have amazing attention to detail but also captured the charm of the little locos brilliantly. Abbostone was next to a big N gauge layout which had its little locos thundering around at what most of been a scale of 100mph+ so seeing these big trains slowly past by was very pleasing on the eyes and on the camera. Up next we have Ynysafan a OO finescale layout owned by the North Gwent Modellers. 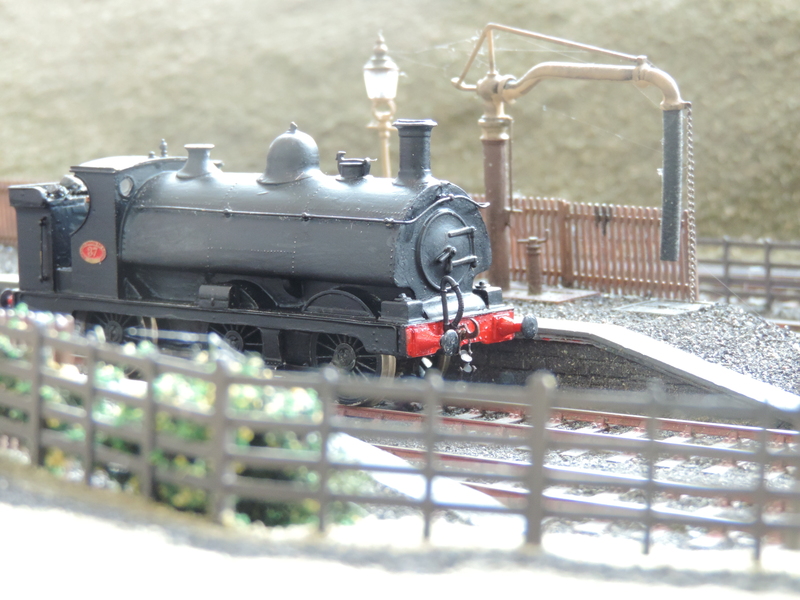 The layout is based on the real life Ynysafan station which has as interesting history. By 1880 the coal mine owners in the upper Rhondda valley needed an alternative outlet for their coal other than the existing Taff Vale Railway route to Cardiff docks. The Rhondda and Swansea Bay Railway was constructed in the 1880’s from Port Talbot into the Afon Valley, with the first section to Pontrhydyfen opening in June 1885. The line was subsequently extended to the head of the valley and through a 2 mile tunnel to form an end on junction with the Taff Vale Railway at Treherbent and, a further extension in the opposite direction to Swansea docks, enabled coal produced in Rhondda valley to be taken down the Afan valley and on to Swansea docks. It also allowed through running passenger trains between Cardiff and Swansea via the valleys so relieving the busy coastal main line. The R.& S.B.R. and T.V.R both provided through trains though engines were changed at Treherbert. As can be expected with the opening of this busy new route coal mining in the Afan valley itself developed rapidly. The GWR took a controlling interest in the R.& S.B.R. in 1906 and provided engines to supplement those on the R.& S.B.R.. These engines were repainted and renumbered as R.& S.B.R. locos. The North Gwent Modellers have based their model of Ynysafan on Pontrhydyfen as it would have been in the pre-grouping period. The baseboards are 12mm ply, the track is SMP Scaleway with scratch built points operated by wire in tube and ballasted with ash collected from local closed railways. All the buildings are scratch built, coped from old photographs and plans we have managed to collect of buildings that existed at Pontrhydyfen and Cwmavon. The prototypical rolling stock is a mixture of kit built and ready to run suitably altered for the period. This was another great layout that featured lots of open space and allowed people to focus on watching the trains roll past. Despite being a so-called GWR man I am ashamed to say I didn’t know anything about the real life line this is based on so have been enjoying reading up on its history. All the wagons and coaches are attached to the locomotive using chains rather than couplings which is what I use on my layout so was able to get some great tips on how to use them best from the operators. 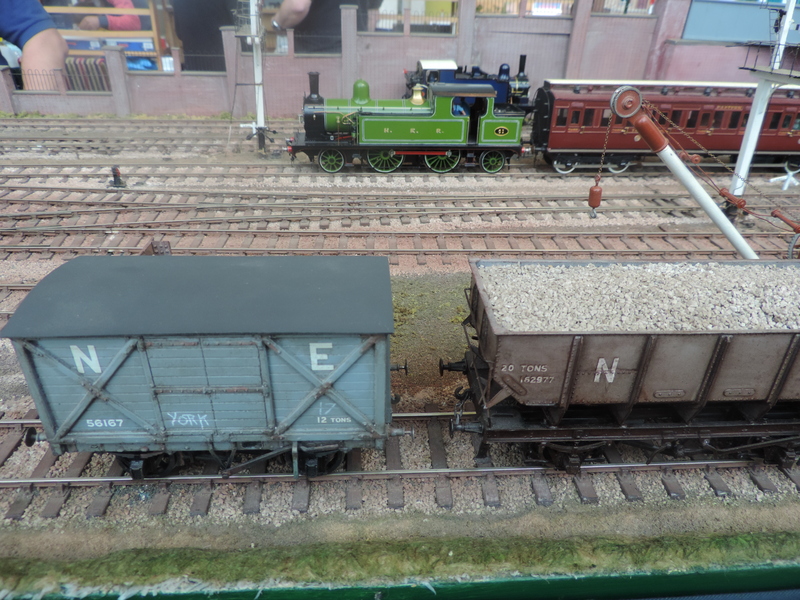 Thanks for reading todays look at 2 great layouts in attendance at the Fareham RailEx 2014 and stay tuned for some more layouts coming soon. I know the feeling I am lucky that its the start of a very small event season for me, got the Victory Model Railway club show the 18th October (small one basically 4 or 5 layouts), the Portsmouth Model Railway Exhibitionon the 29th December (12 layouts with amazing GWR pre-grouping layout attending – expect a post for just that one layout) and the BIG show on the 24th January with the Southampton Model Railway Exhibition (previously featured several times on here). Have you ever put your post code into this website (http://www.ukmodelshops.co.uk/events/local) thats how I find my shows.